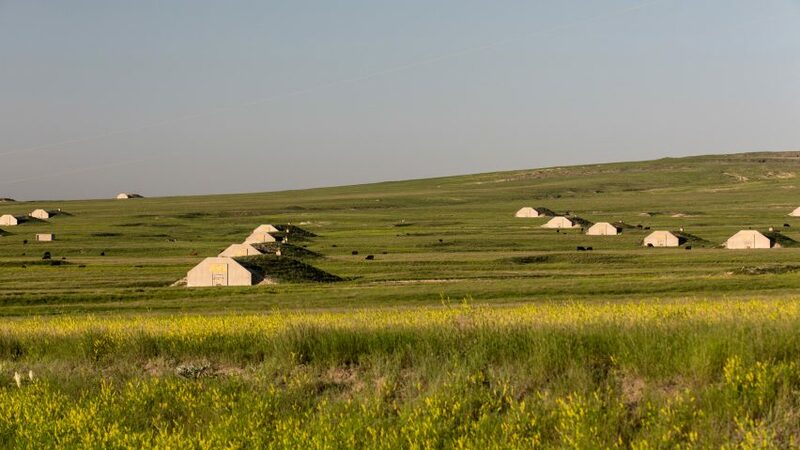 These mounds in the landscape of South Dakota are formed by hundreds of concrete military bunkers, which are being repurposed to create the world's "largest survival shelter community". Families and groups can lease the bunkers to be used as refuges in the wake of a catastrophic event, such as a nuclear war, a viral pandemic or an asteroid strike. The peace of mind costs a $25,000 (around £20,500) downpayment, plus a 99-year land lease of $1,000 per year. Vivos xPoint – the self-proclaimed largest survival community on Earth – is located in the Black Hills area of South Dakota, just south of the city of Edgemont. The 575 hardened concrete bunkers on the site were originally built in 1942 as an army munitions depot known as Fort Igloo, which was eventually retired in 1967. California-based survival company Vivos is now repurposing the massive complex, which is spread over approximately 18 square miles. The off-grid area is surrounded by a fence, and reached by road or a nearby municipal airport. "It is strategically and centrally located in one of the safest areas of North America, at a high and dry altitude of [around] 3,800 feet," said Vivos, "with relatively mild weather, well inland from all large bodies of water; and [approximately] 100 miles from the nearest known military nuclear targets." The earth-covered bunkers are reportedly built and fortified to withstand a 500,000-pound blast (seven bars of pressure). They are separated from each other by an average of 400 feet (122 metres) in all directions. According to Vivos, each shelter can accommodate 10 to 20 people and the necessary supplies to survive for a year. They measure 26.5 feet (eight metres) wide inside, with lengths of 60 and 80 feet (18.3 and 24.4 metres). The arched ceilings reach 13 feet (four metres) at the highest point, and the spaces can be sealed with concrete and steel blast doors. Interiors can be fitted out to renters' specifications, but the costs are extra. "Your bunker will be your blank canvas to prepare as much, or as little as you like, with no restrictions on how many people will share it with you when the moment of truth (aka SHTF) arrives," said Vivos. Instead of windows, LEDs would be placed inside the bunkers to simulate the changing views of the outside world. Water is pumped in from two underground wells and stored in reinforced concrete tanks before being deployed to each bunker. Onsite amenities range from a grocery store and a medical clinic, to a shooting range and a hot tub spa, for if and when it is safe to venture outside. Vivos also promises 24/7 security with military-trained guards and camera systems. The company also offers shelter at a facility in Indiana, and is developing a similar community at an abandoned fortress in Europe. Design for survival became a hot topic in 2012, when the ancient Mayan civilisation predicted the end of world would come. Ahead of the prophesied date, creatives launched ideas that included a kit containing practical items, and a collection of apocalypse apparel for surviving extreme conditions in style. Concrete bunkers around the world, many of which were built during the world wars of the early 20th century, have been repurposed in a variety of ways. In the Netherlands, one was transformed into a tiny vacation home while another was spilt in half to create a visitor attraction.